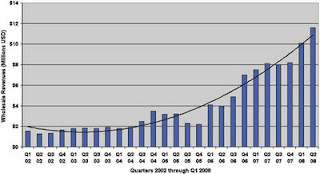 The International Digital Publishing Forum (IDPF) today published its latest trade ebook sales figures for the quarter ending June 2008. Wholesale trade ebook revenues for the month of June surged 43% to $11.6 million compared to $8.1 million in the same period a year ago, while sales for the first six months of 2008 grew 43% compared to the same period a year ago. Trade eBook sales were $4,900,000 for June 2008 alone, an 87.4% increase over June 2007. Bottom line, folks, ebook sales are accelerating in the marketplace, yet they still represent a small piece of the overall book publishing industry pie. Some notes about the data above: 1. The data is US-only. 2. The data reflects wholesale sales as reported by 12-15 leading publishers, so actual sales figures to customers were probably approximately twice those reported here. For self-published indie authors, the data above sends a clear message that if your book isn't available in ebook form, you could be missing out on an important sales channel. If you haven't yet published your book on Smashwords, go ahead and do it. It takes 5 minutes or less and you control all aspects of marketing, pricing and sampling.